Trikke basically a perfect combination of exercise and fun. Trikke is a three-wheeled cambering vehicles which run by human power. It is very exciting to know that a rider can propel this chainless, pedal-less machine without ever touching foot to the ground.In 1988, Brazilians Gildo Beleski and Osorio Trentini created a three-wheeled vehicle for riding downhill with greater stability. They discovered that the vehicle would continue to move forward as long as the rider continued to turn and lean into each turn repeatedly. They helped found the company that now produces Trikkes, Trikke Tech Inc., based in California. Trikke basically a perfect combination of exercise and fun. Trikke is a three-wheeled cambering vehicles which run by human power. It is very exciting to know that a rider can propel this chainless, pedal-less machine without ever touching foot to the ground. Working Principle of Trikke Trikke (pronounced trike) works on a fundamental physics principle known as the Conservation of Angular Momentum. While travelling on a slalom-like path, a rider moves his centre of gravity (his mass) from left to right (for example) while leaning the vehicle into a right turn; this movement of the rider’s mass is towards the centre of the turn, thus decreasing the radius of an imaginary circle which is formed around the centre point of the rider’s turn. Because of the vehicle’s design, a rider can learn to maximize the velocity generated from making each turn and then transfer that momentum into the next turn, and so on and so on. Propulsion can be so effortless that it feels like magic, or as strenuous as a full-blown sprint. Total body involvement-From head to toe, riding a Trikke gets your whole body involved. Your arms are moving, your legs are working, your core is turning, all of which translates into a full-body workout like no other. Mind Exercise-Because riding a Trikke involves crossing the midline, your brain also gets into the action, helping to keep your noggin engaged and active. Superb Cardio Exercise-What better way to get your lungs and heart involved than by using your entire body? The Trikke gets you moving in a way that’s natural and intuitive, making your want more! Lose weight with fun-Studies have shown that riding a Trikke burns over 650 calories an hour while riding at a speed of 11 mph. Combines Strength Training and Cross Training-Because your muscles and cardiovascular system are engaged, riding a Trikke means you’re getting the best of both worlds: strength training and cross training. 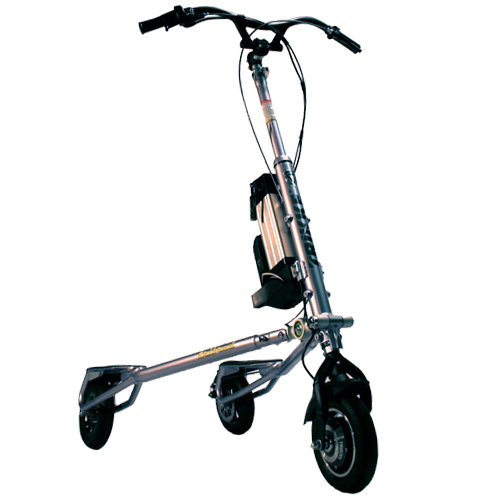 Enhances Balance and Coordination-When standing on a Trikke, you’re standing on your own two feet, which means, as you ride, you’re also working on your balance and coordination. For all age group-Whether it’s the very young or the young at heart, Trikkes can be ridden by anyone. President Jimmy Carter and wife Rosyln Carter are both avid Trikke riders and they’re in their mid 80s! Can Be Used in Areas Big and Small-Riding a Trikke is fun, whether you’re “rocking and rolling” on a wide open bike path, a driveway, or in a family garage during winter.